Twickenham's World Rugby Museum will take delivery of a true relic of the game next week. It is a jersey once worn by fullback Bob Scott - now the oldest living All Black and, in the eyes of many in a strong position to judge, the greatest of any time. It is black, but not an All Black shirt. In fact it is something much rarer and more precious, worn when Scott was a member of the 1945-6 New Zealand Armed Forces touring team, popularly known as the Kiwis. It is a rarity not only because of its age, but because the tour was a one-off and took place at a time when clothing was rationed and other types of uniform took precedence. A gift from the now inactive Osterley Rugby Club, it also marks one of the odder occasions in rugby history, the day in the spring of 1946 when a junior club took on a Test-quality touring team. Osterley player Tennant Eastman recalled in the club history that a relationship had been struck up when tour captain Fred Allen and full-back Bert Cook attended their annual dinner as guests and had a high old time. "We literally had to carry them to Twickenham the next day for the Middlesex Sevens, which the Kiwis won". A few days later the touring team found their return home, in those days still by boat, delayed by a strike at Tilbury. Determined to pass the extra time constructively Allen remembered his generous hosts, rang Eastman and suggested a game. Eastman recalled: "What a dilemma. The club house was closed for the summer, the posts stowed away and the grass about a foot high. Frantic telephone calls to the Rugby Union to obtain permission to play in the close season resulted in the whole club turning out with mowers, scythes, sickles etc and I recall towing all sorts of mowers around the ground with my new Opel car." Around 2,000 spectators went to Osterley's Wood Lane ground, no more than an open field with a small clubhouse. Eastman remembered: "A most enjoyable game was had by one and all. The result was immaterial, the score unknown. At half-time some of the Kiwis switched sides and after the game it was most rewarding and appreciated to see Cook, Bob Scott and others still on the field coaching some of the local players". Scott's shirt, which hung for many years in Osterley's clubhouse along with a picture of both teams, was presented to the club by Allen. Its presentation to the museum next week has been organised by Les Evans, a Twickenham guide whose late brother Roy played more than 1000 matches at prop for Osterley. The Evening News story previewing the game was headlined 'This is why we like the Kiwis'. Getting liked was what the team, the brainchild of New Zealand Forces commander Bernard Freyberg and successor to a similar team which had played in Britain immediately after the First World War, had done very well throughout their tour. "They won 29 out of 33 matches in Britain, Ireland and France including victories over England and Wales and two over France"
They were captained by Charles Saxton, the one pre-war All Black in the squad, and played to his dictum that 'rugby is about 14 men putting a fifteenth into the clear'. Any touring team would probably have attracted decent crowds, since the post-war years saw crowds for all sport reaching record levels. But as Welsh journalist John Billot recalled, attendances such as the combined 50,000 who attended their final two Welsh matches at Pontypool and Aberavon were tribute to much more than a sports-starved public. He wrote in 1972 that they had "audience appeal exceeding all of the New Zealand teams who have followed them to Wales". They were also successful from their 22-6 victory over Swansea, avenging a famous All Black defeat a decade earlier, in their opening match onwards. 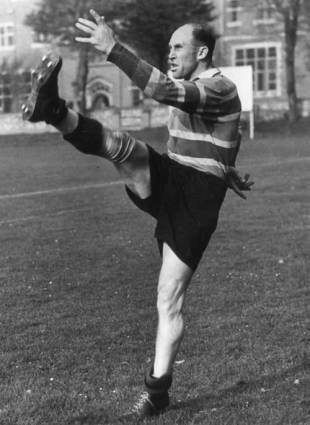 They won 29 out of 33 matches in Britain, Ireland and France including victories over England and Wales - a victory highlighted by an extraordinary 70 yard try by wing Jim Sherratt - and two over France. They lost only to Scotland and Monmouthshire, whose 15-0 win highlighted by a hat-trick from Headley Rowland counted, to pick up the theme of a recent Numbers Game, as the most impressive nilling of a touring team by non-international British opposition until Munster flattened Graeme Mourie's pioneering grand-slamming All Blacks by 12-0 at Thomond Park in 1978. The Kiwis did not play Ireland, but Leinster shared with Newport the distinction of holding them to a draw. Half of the team went on to be All Blacks, with Allen, Scott and centre J.B.Smith, remembered by Bleddyn Williams as one of his greatest opponents, attaining legendary status. Their philosophy also fed into the postwar New Zealand game, but suffered a severe setback when the 1949 All Blacks, led by Allen and including eight Kiwis - among them Scott - went down 4-0 in South Africa in spite of scoring more tries in three of the four tests. Which of a brilliant Springbok pack and less than brilliant home town refereeing was more responsible for the whitewash remains a matter for debate among historically-aware New Zealanders to this day. The grinding Otago style, refined in the early 1950s by Canterbury, became the New Zealand norm for a decade and more. Not until 1967, when Saxton was manager and Allen coach of an All Black side that stunned British opponents with some brilliant open play, was anything like the Kiwi style seen again from a New Zealand team playing in Britain. Chris Laidlaw, scrum-half in 1967, tells the story of an incredulous Colin Meads saying to Allen "you mean we're going to run the ball all the time?" when tactics were being discussed. That philosophy, two of its greatest practitioners and memories of the day when they played against a junior club for the sheer hell of it, are what is being commemorated at Twickenham next week.